Malpractices are some of the shocking revelations that came to the fore after chaos erupted at the Machakos University College over alleged mismanagement at the institution of higher learning. The revelation adds a new dimension to the mismanagement of the varsity, which has been hit by a “corrosive” scandal. Senior academic stakeholders are now demanding the dismissal of the principal Prof Francis Mathooko, asserting that his actions have put the survival of the institution at risk. They revealed that staff cuts at the university have been based on “inaccurate, misleading” data, and lamented against the decline in academic research expenditures. “We believe this direction places the very survival of the university at risk,” deans said. Rowdy students went on rampage alleging nepotism and fishy deals by the top brass. 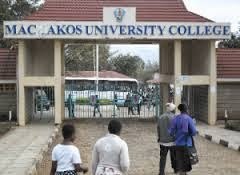 “Bad governance and corruption are still the order of the day at this college in Machakos county,” lectures and students said. Speaking to Weekly Citizen on a condition of anonymity, students said the administration has failed to ensure that the funds of the university are expended on the purpose for which they are provided. Students have a long list of complaints about mismanagement and corruption at the university, including a recently-exposed scandal involving procurement of goods. Again, bureaucracy, wastage, incompetence and irresponsibility by principals are the main problems that have made colleges fail to achieve their performance. But according to Prof Mathooko, the university is in the best financial condition that it has been since he was posted to head the institution. Mathooko said the students were furious following delays to switch on the school generator after a power outage that was experienced in the whole of Machakos town. Reports indicate that tear gas canisters used by police had caused fire to break out in one of the dormitories and the affected students were forced to spend the night in classrooms. The embattled principal was appointed to head the university college with effect from December 30 2013. Education cabinet secretary Jacob Kaimenyi made the appointment to replace Prof Godfrey Mse who was serving in an acting capacity. Formerly at Seku University, Mathooko served as a deputy principal academic and student affairs and later as deputy vice chancellor, academic, research and student affairs. In May this year, several people were injured in a stampede in Machakos following a clash between police and students from the university college. Anti-riot police engaged students who had joined their colleagues countrywide to protest against the government’s supposed plans to increase fees in a running battle that saw several injured. At one point, they had to shoot in the air as well as lob teargas canisters to the rowdy students who were hurling stones at them.